Open Parser is a Galaxy Parser for all Starfleet Commander and Stardrift Empires Universes and is based on code by Lytjohan and Eljer. It was written by Matt Hirschfelt with assistance from Eljer, Lytjohan, and FatBuddha. This parser, while created and maintained by Matt Hirschfelt, is not an official Blue Frog Gaming product. As such, use is at your own risk and Blue Frog Gaming will be unable to assist you should the parser interfere with your game play or if the parser stops working. If using this feature on an "Unavailable" slot, the script will attempt to determine the last occupant of the spot and list their location and roaming planet history. Unlike many other parsers available for Starfleet Commander and Stardrift Empires, Open Parser only requires one script for all of the Universes. Once the script is installed, make sure it is enabled. After that, there is nothing further for you do. Open Parser will attempt to automatically notify you if an update becomes available. If you are having trouble installing the parser, please see our Frequently Asked Questions. 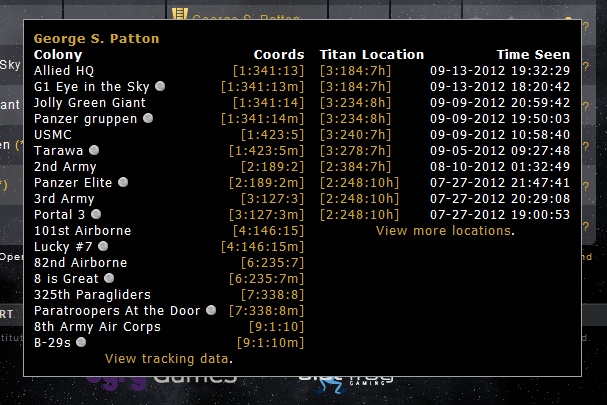 Tracking works by looking for activity on a player's planet every time you scan a system. It then adds a number, either 10 for activity within the last 15 minutes, 5 for activity within the last 16 to 59 minutes, or 1 if no activity is detected. This number is then assigned to that player’s colony for the hour that you parsed. This number is increased each time the system is parsed. So this player during the 10:00UTC is more likely than not to be online at that time. The more times the system is parsed, the more accurate the output is like to be. When viewing this data through our website it is color coded from green (1) to red (10). In short, the higher the number between 1 and 10, the more likely a player is to be online or showing activity during that hour. How do I install the parser with chrome? 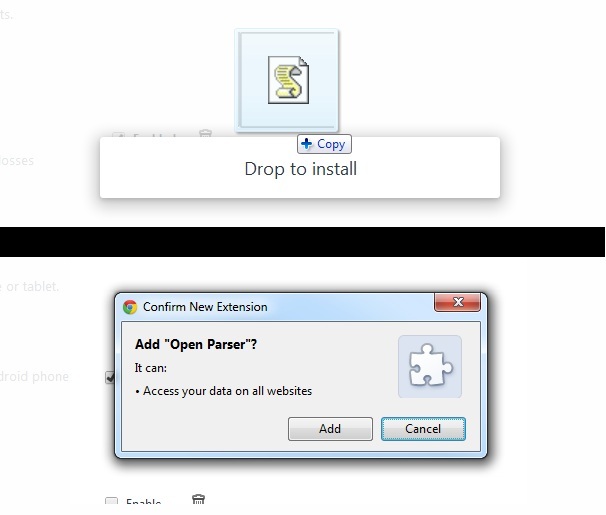 Download Open Parser to your computer. Once downloaded you will need to drag the file from the location you downloaded it to on to your Extensions page. When you drop it on to the Extensions page you will be prompted to install the script. Click Add and you are ready to start browsing the galaxies and using the database. As an alternative, you can download Tampermonkey from the Chrome Web Store. Installation is then similar to with Firefox. How do I install the parser with Firefox? To use the parser with Firefox you need to first install GreaseMonkey as this is what allows userscripts to run on Firefox. 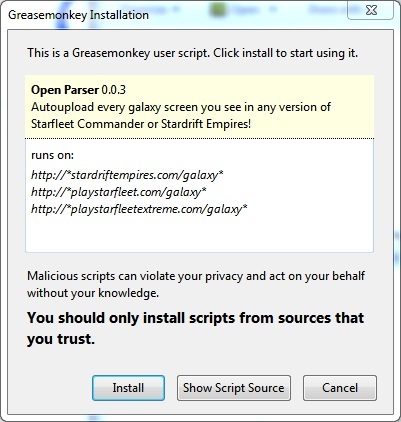 Once you have installed GreaseMonkey, download Open Parser. You will then also be prompted to install the script as shown below. Once installed you are ready to start browsing the galaxies and using the database. How do I install a userscript with Internet Explorer? Very short answer - you can’t. We recommend you either download Chrome or Firefox as their functionality allows the use of userscripts. Matt is available on Skype at MattH_BFG or by e-mail at [email protected].